What are some recent trends and observations in the medical device industry regarding regulatory affairs and strategies? 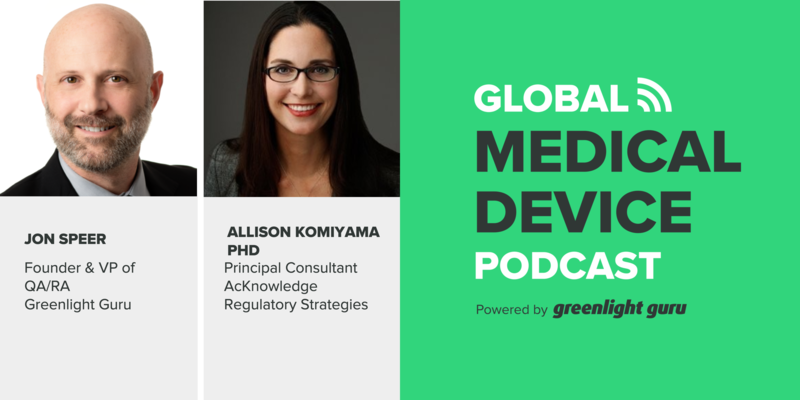 On today’s episode, we have Allison Komiyama of Acknowledge Regulatory Strategies and former FDA reviewer, offering us with a very unique perspective on this topic. Allison is currently a consultant who helps companies with regulatory strategies and submissions, and patient of life-saving medical devices. ● The regulatory path to get devices approved has been under scrutiny for decades. Companies may think it’s too hard or cut corners with FDA regulations. ● Get a second opinion, conduct research, and ask questions about medical devices because your or your loved one’s life may depend on the device. ● FDA reviewers may go into industry because they know how to regulate devices. They understand why regulations are in place to make devices safe, effective. ● If a company does testing, gives the FDA what it needs, and participates in the pre-submission process, the likelihood of a device being approved is greater. ● When preparing regulatory documents, review information available on the FDA’s Website and contact DICE and/or regulatory consultant. ● Consider pre-submission if your company isn’t confident about testing needed or is an early startup that needs guidance on its regulator strategy. ● AI Letter: Puts your device submission on hold for issues and deficiencies that need to be addressed within 180 days. Avoid getting an NSE letter! ● Update your 510(k) summary if a predicate device has been subject to a recall. FDA wants to make sure the new device does not have the same issues. 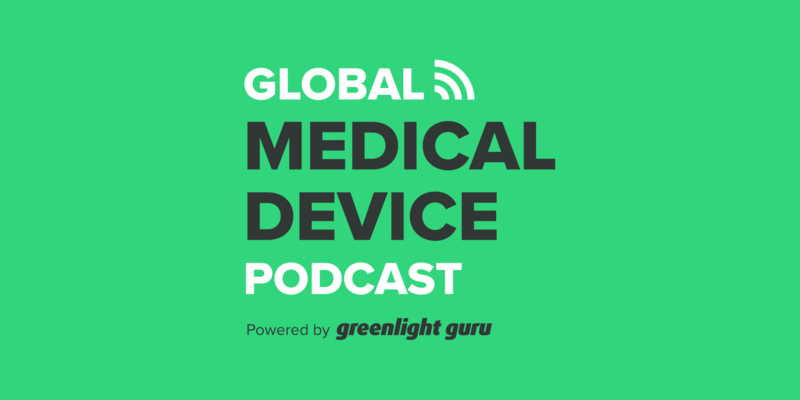 Jon Speer: Alright, I really enjoyed this episode of The Global Medical Device Podcast. I got a chance to catch up with Allison Komiyama. Allison is with AcKnowledge Regulatory Strategies, and she and I talked about a few of, I guess, recent trends and observations that she's had in the industry with respect to regulatory affairs and strategy and things of that nature. So really great perspective. Especially great hearing from her point of view as a former FDA reviewer, as well as a consultant that helps companies with regulatory strategies and submissions. So enjoy this episode of The Global Medical Device Podcast. Jon Speer: Hello, and welcome to another exciting episode of The Global Medical Device Podcast. I am pretty excited about this one because every time I get to talk to Allison Komiyama from AcKnowledge Regulatory Strategies... You can find her, by the way, at acknowledge-rs.com. Everytime I get the chance to talk to her, we have a good time. And Allison, welcome to the Global Medical Device Podcast. Allison Komiyama: Thank you, Jon. It's good to be back. Jon Speer: You got it. So you and I were catching up the other day, and we were talking about some of this, I guess... I hate to say trends, but maybe some things that you and I have observed on the regulatory front. And what I was hoping we could do today is talk about both sides of that equation. Of course, a lot of people know that you used to be an FDA reviewer, and so we wanna pick your brain about that side of the coin, if you will. And now in your current practice with Acknowledge RS, talk a little bit about some of the things that you've seen. So, fair game? We're just gonna dive in and talk about a few different things. Allison Komiyama: Yeah, let's do it. Jon Speer: Alright. So, first thing. I do kinda wanna, hopefully, put to bed an issue, or a topic that has surfaced in recent weeks and months in our industry, and maybe it's always gonna be there. But it seems like there's a lot of attempts to poke holes into, "FDA does this. Should they do that? Should they do that?" And the industry is trying to cut a corner here and cut a corner there and that sort of thing. And I wonder if you could just talk about that a little bit? Like I said, you've been on both sides of the equation. I remember you sharing something with me a while back that, "Hey, FDA reviewers care about this stuff too." Can you maybe just speak to a little bit of that and kinda your observations on both sides of that fence? Allison Komiyama: Yeah. And I watched it as well. And I think you bring up an interesting point. I have been on both sides, the FDA, and on the industry side, and now as a consultant for a medical device company. But I think I've also been on the third side, and I've been the recipient of medical devices. I've had life-saving treatments that, without FDA regulated drugs and devices, a lot of us wouldn't be here. So I feel like pretty much everyone's been a patient, right? And I think the nice part about it is that we do have this technology that can help us in so many ways. What I thought was really powerful about that documentary is it really gave a voice to the third side of the coin here, which is the patient side. And I think it was a valuable lesson at the end to say, "Hey, ask questions. Don't be shy to be an advocate for yourself and step up. And don't trust doctors or FDA. Trust yourself as well, and do your own research." But one of the things that's hard is... And I think there was a quote in that documentary when I was... I watched it again last night 'cause I thought this might be a topic we'd bring up today. Is that there was a doctor that said, "We can't trust the medical device manufacturers and we certainly can't trust FDA." And I was thinking, "Well, then who?" We can't just trust the patients as well. Jon Speer: It's a great series, by the way. Jon Speer: It's a really great series. Folks, you should check that out. Go to acknowledge-rs.com, and you can go to Allison's blog, and you can read these posts. They're fantastic. Allison Komiyama: Yeah. And it sort of highlights the diversity of careers that former FDA reviewers go on to have and how they can really benefit industry, and benefit medical device technology, and ultimately benefit patients that are getting these treatments. So I do feel very strongly that FDA reviewers have the best interests of patients in mind, but again, you have to be your own advocate as well, and really take care of doing the research and understanding what's going into your body. Jon Speer: Well, let's be real here. FDA reviewers, they are people too. Allison Komiyama: They're patients too, exactly. Allison Komiyama: [chuckle] There's probably not a single one of us that hasn't had a tongue depressor in our mouth or a band-aid on our body. And we've all been the recipient. Jon Speer: We certainly know somebody who has, yeah. Allison Komiyama: Exactly. Exactly. There's a lot of power with these medical advances that are going on, but thank goodness, I feel, that we have FDA to review these things and make sure they are safe and effective, and that people are going to be able to use them, and use them correctly. Jon Speer: For sure. And I remember you sharing some stories a while back when you were an FDA reviewer, and you shared some stories about you really took it seriously and you cared about helping advance technology and advance medicine and advance the quality of life. And I don't know if you have any anecdote or story that you could share from that time as an FDA reviewer where you were looking at this information that was being presented to you with that kind of passion. Do you have any stories that come to mind? Allison Komiyama: You know? He... It was just something that I was like, "Wow, I'm glad that I know the other side of what went into getting this device onto the market. Because I knew that there had been clinical testing, I knew that there had been biocompatibility performance testing. There's a lot that goes into these files and into these devices before they're allowed to be used on patients. And I think it's a disservice to say that things just get through because it's substantially equivalent. There is a lot of testing that goes on. Jon Speer: For sure. And I wanna touch on that here in a moment. But folks, heed the advice that Allison is providing you. As a patient, we have... It's your life. It's your... You should take some responsibility for that. Even if it's a loved one. Hi mom. I'm gonna tell a story about my mom. [chuckle] I remember a few years back, my, I think it was a grandparent that was undergoing some sort of procedure. And I wasn't there with the doctor visit. My mom was like, "Oh, the doctor was so nice." I'm like, "Well, okay, well, did you ask him this, did you ask him that? Did you... " She's like, "No, but he was so nice." I go, "Well, that doesn't make him a good doctor." You know? But a lot of people think that because the doctor is nice... Now, don't mishear me, nice doctors can be good doctors. But just because somebody is nice doesn't necessarily mean that they're good. And so I would encourage you as a patient or as a loved one who has family members who may undergo procedures. Jon Speer: Ask questions, be informed. Come from that position rather than just whether or not the guy or the lady is nice. So do use that advice. It's a really good tip. But I do wanna talk a little bit about the documentary. And even long before this documentary, the whole regulatory path to get devices cleared and approved and to market. That's been under scrutiny for decades. And some people are like, "Oh, the 510K path is too hard." And others are like, "Oh it's way too easy." And that sort of thing. But you were sharing a story with me the other day that even though it is a somewhat well-established or well-known pathway, the 510K pathway is by no stretch of the imagination, easy. Jon Speer: So, you were sharing a story where... And folks, just like with your doctor, same sort of thing with your regulatory affairs professionals, ask a lot of questions, come from an informed position. 'Cause there's... I hate to say it, but there's a lot of people out there who are providing regulatory advice, who are helping companies with submissions, and it's reckless. And Allison, you were sharing a story about that. So do you mind... We'll protect the innocent I suppose, but [chuckle] maybe sharing some of the experiences that you encountered with a recent client? Allison Komiyama: Yeah, no, absolutely. I think, as you said, there are good doctors. There are doctors that maybe you should ask additional questions of. I think the same thing goes for your regulatory consultant. I think the... Yeah, and what you're referencing is I was complaining about a company that does a lot of testing for companies that need third party testing for performance. And we're seeing this more and more with the third-party test labs that have services saying, "Yeah, we can do your 510K for you, we can do your regulatory strategy and get this through for you." And unfortunately, we've been doing some salvage work with these 510Ks that end up getting NSEs, which is a non-substantial equivalent decision, based on the inadequate responses to the additional information letters that FDA has been issuing. Allison Komiyama: And I think it's a bummer because these are devices that if the medical device manufacturer had done the right testing, had given FDA what they needed, and that's looking at the predicate devices, seeing what testing actually needs to be done before you submit your file. But also, does it need to have a pre-submission? Should you go to FDA and talk to them and say, "Hey, here's the testing we're planning on doing. Does FDA agree or would there be additional testing that would be needed?" Unfortunately, if you just go to FDA with the 510k and say, "Here we think we've put the right testing together", be prepared for additional questions and deficiencies from the agency. And make sure you have a good advocate, that you have a regulatory consultant that can help you address those questions and get those deficiencies cleared up so FDA can clear it and they can say, "Yeah, this is substantially equivalent. You've done your testing, you've done your due diligence." Jon Speer: Yeah. And I think folks... I know that our listening audience ranges from early stage startups who are doing this for the first time, to those who have been through this path many, many times before. But regardless, your submission to the agency is a reflection of your brand. And I think a lot of times companies don't think about that. And if it's your first submission, whether you like it or not, you're setting a first impression. And that old cliche, that first impression is pretty important, it is true. And so if you're sending, I'll say, poor quality submission that's deficient in a lot of areas, you're setting yourselves up for some challenges down the road. Now it's not... It's certainly something that you can address and correct, but you can also, with a little bit of planning, a little bit of strategy and working with the right resources, you can avoid it all together. So do you have any tips for folks that are maybe considering their options when it comes to submissions, whether it be a pre-sub or a 510K or idea and that sort of thing? Do you have any tips that people should take as they're starting to prepare these different regulatory type of documents? Jon Speer: Yeah. I was trying to figure out the C myself. And I know what it is but you just put me on the spot. Allison Komiyama: DICE. It's short for DICE. But they will pick up the phone and answer questions if you call them. They're there every single day. They have somebody that will answer simple questions. If you were gonna ask, "Hey do I need this test? What do you think about this?" They're going to say, "Hey, you should maybe consider a pre-submission and come to FDA and talk to us." It's always good to get a half an hour of free consulting with us. We're happy to pick up the phone as well and say, "Yeah, it sounds like you have a medical device. Here's where we would start. Maybe you do need a pre-submission. Maybe the regulatory strategy is abundantly clear based on what the predicate devices have done. In that case, could you just go in? Here's the testing that you're going to need, and just go in with a 510k." There's never a really... I should say it's never really black and white of, "Well, this is exactly what you have to do." Allison Komiyama: There are different strategies. There's different risks associated with different pathways that you choose. It depends on your pain point, right? If you want to just get this in as fast as you can. Or is money a hardship? There are different ways to address those issues and also give FDA still, at the end of the day, the best product so you can get your device on the market. Jon Speer: Yeah. And folks, the worst thing you can do is just throw it over the wall and cross your fingers and hope that it's good. Jon Speer: But a lot of people do that. And I remember... Many years ago I worked for a large med device company. And this is a different era of regulatory, different era of communication with FDA. We used to do that. In fact, we were discouraged from having advanced communications with FDA. We were gonna submit the 510k and there was probably no dialog or exchange. And folks, this is not the current state of affairs in working with the FDA. That dialog, that communication with the agency, is not only encouraged, but it will be very helpful and basically smooth the process. And I think with that pre-submission, we've talked a lot about that in previous episodes of The Global Medical Device Podcast before, but that pre-submission program, it's popular today. And it's not just popular, it's a good thing. And to Allison's point, not every 510k is going to necessarily require or be a good candidate for pre-submission, but there are quite a few that are. So can you give maybe a few thoughts or ideas as to when I should consider a pre-submission as a precursor to a 510k? Allison Komiyama: Sure. I'd say the two most common that we get here at Acknowledge is if a company isn't quite confident of the testing that they're going to need. Maybe there is a new feature of the device that looks like it might need additional testing. Is it an animal study? Is there going to be a new performance test that there's no standard for? Can we ask FDA... "Here's a draft of the protocol we've put together. Can you review it and let us know if this would be an adequate test to address this new feature?" So that... If we have questions about testing, those are probably the most common pre-submissions we have, and those are very valuable to get FDA's input on that. I would say the other one is if you... Really early start-ups. We work with companies that have an idea and have a sketch on the back of a cocktail napkin that says, "Here's what we think we wanna do." Going to FDA, you can go as early as you want to the agency and talk about your proposed device. For those, I find... For the early start-ups that really wanna get feedback from FDA, that's valuable for oftentimes the investors that are interested in, "Hey have you thought about your regulatory strategy? What testing are you looking at, but also is FDA on board that this is a moderate risk device?" And so that's the second type of pre-sub we do quite frequently. Jon Speer: Yeah, and folks, pre-submissions don't cost anything as far as dollars. You know? So that's the other nice thing to consider with pre-subs. Of course, there's your time, there's Allison's time to help you prepare that. But you're not paying a user fee for FDA to review and give you some feedback on your device with utilizing the pre-submission. I wanna remind folks, I'm talking to Allison Komiyama with Acknowledge Regulatory Strategies. And you can learn more about her consulting practice at acknowledge-rs.com. So, Allison, even with pre-submissions, and you get to a 510k, there is a chance that you may get an AI letter. So what is an AI letter, and what should I do about it if I get one? Allison Komiyama: Yeah. So the AI letter... And I know I mentioned this earlier, I probably should explain it better, is a hold letter. They used to call them telephone holds because they'd give you a call and then send you an email that says, "Here are all the deficiencies you have." But it's FDA's way of saying, "Here are the outstanding issues that we believe we still need to understand about your device. Or maybe it's additional testing that we recommend you do so we can... To address the substantial equivalents question." If it's a new feature of your device, as I said, they might have additional clarification needed. Or they might say, "Hey, can you provide some additional testing on that component?" Let's say. They're becoming more common, I would say. FDA used to have the chance at sending two AI letters. But after the MDUFA IV they said, "Okay, we're gonna take that down to just... You only get one shot. You only get one AI hold letter." You also have the refuse to accept checklist, which happens within the first 15 days. So FDA's expectations of your file, they want it to be the best file that's crossing their threshold and coming onto their desk. But then once they've done the substantive review of your file, if they have additional questions, that's what goes into the hold letter. Allison Komiyama: There's an incentive for them to get it back to you to get you that information you need so you can start the testing and get it done within the 180 days that you have for that hold. Jon Speer: Yeah, and I'll give you a softball question here. If you do happen to get an AI letter, is there any reason that you can think of why you would not take advantage of that teleconference with the FDA reviewer? Allison Komiyama: So we actually have one that we just got the other day. It's three questions long. It's a very straightforward hold letter. We think we can probably address the concerns within two weeks. That would be the case where I'd say, "I don't think we actually need that clarification." I think... It is nice to meet your review team and talk to your lead reviewer. I find anytime you can interact with your review team and have it be a collaborative effort it is beneficial for all parties. But that would be the only time where I'm like, "We are very clear, FDA has made it so there are no clarification questions needed, therefore we're good to move forward." Jon Speer: Yeah. And that's the exception, I would say, at least in my experience. Sometimes... And it's not because they're trying to be contentious or anything. But sometimes the questions that I received in an AI letter, I just didn't understand the question, quite frankly. Jon Speer: And you gotta think about it. FDA sees everything, or for the most part everything. So there might be other submissions that are coming in from other products, or different technologies all together that may be using similar sorts of methodologies or approaches. And all the standards that are out there, and the guidance documents that are out there. And there have been times where the question just... I didn't understand the relevance of the question. And if you have any confusion whatsoever about what it is, that teleconference is so, so important, because you have an opportunity, as Allison mentioned, to have that dialog, to have that communication directly, live, with the FDA review team. So it's very invaluable. And I think the other thing that's probably good to highlight to people, in days past there used to be... There was... Well, I'm going way back so I'm gonna show my age just a little bit. This predates the refuse to accept, or the RTA provisions that are in place now. But used to be you'd get questions in an AI letter, you might respond to those questions. There was a chance that you were gonna get maybe even a second letter from FDA, another AI letter, with additional questions on top of that. Those days are gone too, aren't they? Allison Komiyama: Yes. Yeah, absolutely. Unless there's... I guess the only time I would say that they might have additional questions is if something comes up after you've submitted the AI response. If there's something that they found out about your device, that's when they will ask additional questions if they have them. Now, they will ask... You can submit your AI response, and oftentimes we'll get one or two more interactive questions with the agency, and it'll be more on the side of, "Can you fix your 510k summary", which is a document that goes public, "Before we clear this?" And you feel pretty confident at that point that you're going to get clearance. Jon Speer: Yeah. I love that question because that means everything else is good to go. But folks, do understand that when you get the AI letter, you have 180 days. Not that you'll need 180 days. Sometimes you do. Sometimes you need to ask for an extension. But it is important to get those questions answered to the best of your knowledge and ability, because if you do not satisfy the needs of the agency, that's when you get the... Well, in the world of 510k process, the worst news possible. And the worst news possible is that NSE letter. You don't want that. Jon Speer: Because what happens if you happen to get an NSE letter? What do you have to do now? Allison Komiyama: Right. So, the NSE letter, the non-substantial equivalent letter, in that they'll list the deficiencies that they don't feel that you've adequately addressed. So, you'll have to submit a new 510k. If you wanna get your device cleared you will need to submit a new file. You can reference the previous file that you submitted, but you will also have to then include the NSE letter, or any of the previous deficiencies that were sent to you, and address them in that new 510k. So, you have a little more work ahead of you in that next submission. Jon Speer: For sure. So, Allison, I know we've hit on a few tips and pointers in some of the observations that you've seen in recent weeks and months regarding regulatory side of things. Any other thoughts, or stories, or tips that you'd wanna share with the listening audience? Allison Komiyama: Yeah. I was just thinking that one of the things that we just talked about is updating the 510k summary. And what I have noticed, and I'm wondering if this is... With the pressure that FDA has been feeling, especially with the documentary we were talking about earlier. One of the complaints in that documentary was that a predicate device can have been subject to a recall. And FDA is just saying, "Well, we don't really care if it has been subject to a recall or not. We're just evaluating equivalence here." But that's not true. I have been finding... One of the final things that FDA has been asking in the 510k summaries is to say, "What is your primary predicate? And please, make a statement that this predicate device has not been subject to a recall based on the design or the testing of the device." So, FDA is saying, "No, we absolutely are looking at that. We don't want to... If there's a device that has made mistakes or has been recalled, we wanna make sure that the new device doesn't have the same issues." And if the new device has adequately mitigated those risks, they want that information included in the 510k summary. Jon Speer: So, the summary there is choose your predicates wisely. Jon Speer: And make sure you understand the state of that predicate device, as far as if there have been regulatory issues. And if by chance there have been, be prepared to explain why it is a suitable predicate, and what you've done about it to address any sort of concerns that might be out there with that other device. So, that's a really good tip. I've also heard, Allison, you mentioned Mike Drues earlier. I was chatting with him the other day. He's already seen, in recent submissions, I think pre-subs specifically, where devices that have already been on the market where they were doing a new 510k, or planning a new 510k for a label expansion. These are products that have been in use for, in some cases, hundreds of thousands, and I think in one example that he was sharing with me, over a million cases, and there's now a request for more clinical evidence to support that. So, these things that do happen, we should pay attention to those as medical device professionals. Even if it is a documentary that seems to be one sided, do realize that folks like Allison, and me, and even FDA, are paying attention to those things. And it can influence the things that need to be done. So, it's good that you're in the know across the board. Jon Speer: So, Allison, I wanna thank you so much for taking time to chat with me. And on this episode of The Global Medical Device Podcast. Again, folks, I've been talking with Allison Komiyama from Acknowledge Regulatory Strategies. And we've been going through a lot of issues and observations that you can mitigate and address, as far as regulatory strategy and regulatory submissions. I would encourage you to learn more about her team and her practice. Go to Acknowledge-RS.com. And if you'd like to learn how to make sure your design controls and your risk management information is up to date and prepared and ready for a 510k submission, yeah, folks that's important in preparing pre-subs, as well as 510Ks and PMAs. You should come over to www.greenlight.guru to learn more about our EQS platform and how we're helping medical device companies get through that regulatory process much faster with less risk. Jon Speer: This has been Jon Speer, the host, founder, and VP of Quality and Regulatory at Greenlight Guru. And you have been listening to The Global Medical Device Podcast.